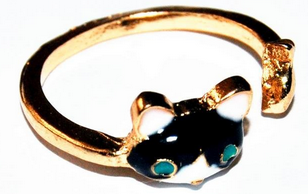 Adorable Cat Ring Only $2.30 SHIPPED! You are here: Home / Great Deals / Amazon Deals / Adorable Cat Ring Only $2.30 SHIPPED! This deal is for all you cat lovers! Grab this adorable Cat Ring for just $2.30 + FREE shipping! I think this one is SO cute! I’m totally grabbing one! It kind of looks like one of our cats!